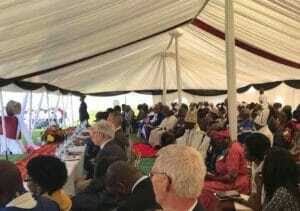 I was privileged to attend the dedication of the full Kalanga Bible held in the southern African nation of Botswana. Many thanks to all those who were praying and celebrating with us! As one who served with the Kalanga for a number of years, this dedication had personal impact for me. I’d like to share some of my thoughts. The Kalanga translation project started with the LCMS mission initiative Forward in Remembrance. It took many years to develop a writing system, gain community consensus, draft, test, and publish the New Testament. Then there was more revising, more publishing, until the full Bible was completed – a total of 34 years later. The list of those who contributed to the project, both local and international, reminded me that we each have a part to play to bring God’s Word to others through their own languages. Why did it take so long? There was disagreement and funding issues through the years, and yes, even infighting. Progress would be made, then personnel changes or sickness would slow everything down. But as I observed the string of dignitaries who participated in the dedication ceremonies, I realized that everything revolved around God’s timing. When the translation project first started, there were many who did not approve. They felt that in addition to Scripture in English, Scripture in only one of the local languages was enough. That language was not Kalanga. Reception of newly translated Kalanga material was limited and tepid. Not anymore! Much has changed over the years. Not only was the translation completed, the Kalanga Bible is the first full Bible to be dedicated in Botswana. That’s a cause for national pride. 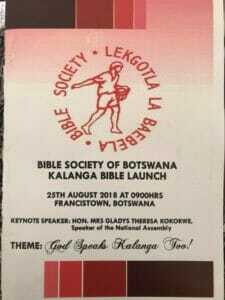 The chairperson of the Botswana National Assembly served as keynote speaker, stating that others in Botswana awaited the Bible in their languages, too. Representatives from other minority language Bible translation projects indicated renewed purpose for their communities. God’s Word changes even nations! As I watched a representative of the House of Chiefs accept the Bible on behalf of those who speak Kalanga, I wondered again if we might be witnessing the fulfillment of a unique and ancient history. If you haven’t already, you might want to read about the lost book and get a fascinating glimpse into the past. In the joy of having God’s Word in our own languages, the problems and delays of the past become dim. Thank you to our local partners and the Bible Society of Botswana, under which umbrella the Bible translation projects in Botswana are progressing. Please continue to pray that in the fullness of God’s time, others might know Christ, too, no matter where they are or what language they speak. Glad you could be a part of this project and we are glad to support you. We are wondering how you and your family are getting along in St. Louis, whether you have found your own housing or are still living with Mical’s parents, not that we have to know this. Glad to hear of Dr. Rutt’s new position at Concordia Seminary.